Perhaps one of the earliest Alamo Plazas to have been opened, Charlotte received a "modern" facade in 1962. According to the researcher, Robby Delius, Charlotte's city business directory lists the Alamo Plaza in 1963 after having received its face lift as "new." 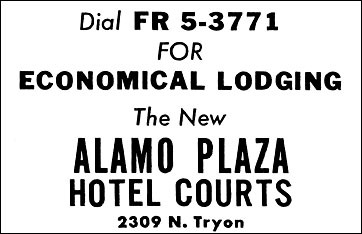 Mr. Delius also discovered that by 1964 all of its guest rooms had been air conditioned, and that as recently as 1985 it was still an Alamo Plaza. He further noted that it was last called the Crown Motor Inn and was managed by "Bob" Patel. Satellite views and address searches indicate that the former Alamo Plaza has been demolished. †The Motel in America indicates that Charlotte opened in 1936. 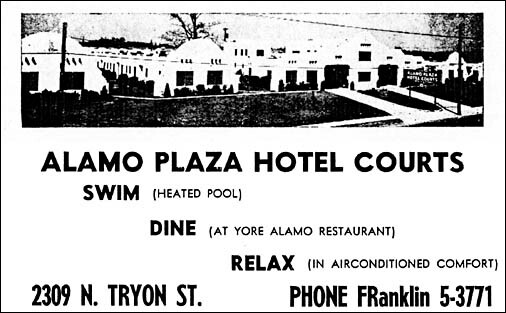 However the Charlotte, NC city business directory does not list the Alamo Plaza until 1947.